Recruiting Native American artists for the "Guiding Feather" documentary features. Contact David for details. 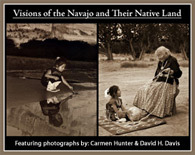 This is the next version of "Native Faces--Desert Light" with an entirely different name and focus featuring interviews, action video, and stills set to music and narration that tells the story of the continuity of generations and artisans. Camera Obscura Gallery Show: Facerock Productions was pleased to open the exhibit, "Visions of the Navajo and Their Native Land: Photographs by Carmen Hunter and David Davis", at the Camera Obscura Gallery in Denver, Colorado. This exhibit ran from April 27 through June 10th, 2007. Both Carmen and David are represented by Hal Gould at Camera Obscura Gallery. March 2002: Opening of Facerock Gallery at Davis Photography Studio--now looking for a new home! If you know of someone looking to sponsor a large collection of interesting images, our gallery is looking for a new place to call home.